Alma Media is purposefully growing its digital media and service businesses in Finland and elsewhere in Europe. Alma Media is a media company focusing on digital services and publishing. In addition to news services, the company’s products provide useful information related to lifestyle, career and business development. The services of Alma Media have expanded from Finland to the Nordic countries, the Baltics and Central Europe. Alma Media’s share is listed on NASDAQ Helsinki. Why invest in Alma Media? Alma Media’s cash flow and balance sheet structure enable continued investments in growth in the future. Furthermore, the company’s long-term financial targets support both growth and an investment approach focused on dividend income. 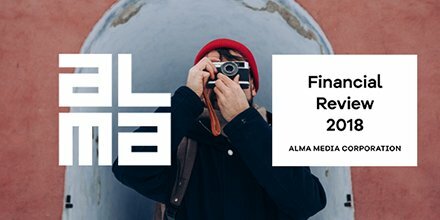 Alma Media's full-year 2018 result was published on 14 February 2019. Alma Media Corporation’s Annual General Meeting 2019 will be held on 15 March 2019. Access to the information and documents on this website is restricted for regulatory reasons. You are requested to review the following information and make the following confirmation when you access this restricted information. THESE MATERIALS ARE NOT DIRECTED AT OR ACCESSIBLE BY ANY PERSONS LOCATED IN AUSTRALIA, CANADA, THE HONG KONG SPECIAL ADMINISTRATIVE REGION OF THE PEOPLE’S REPUBLIC OF CHINA, JAPAN, NEW ZEALAND, SOUTH AFRICA, THE UNITED STATES OR ANY OTHER JURISDICTION IN WHICH IT WOULD BE UNLAWFUL. This website and the information contained herein are not intended for, and must not be accessed by, or distributed or disseminated to, persons resident or physically present in the United States of America (including its territories and possessions, the “United States”), Australia, Canada, the Hong Kong special administrative region of the People’s Republic of China, Japan, New Zealand or South Africa, and do not constitute an offer to sell or the solicitation of an offer to buy or acquire, any shares, rights or other securities of the Company in the United States, Australia, Canada, the Hong Kong special administrative region of the People’s Republic of China, Japan, New Zealand, South Africa or any other country in which it would be contrary to the laws and regulations of that country. These materials are not an offer for sale of securities in the United States. This website and the information contained herein does not constitute an offer to sell or a solicitation of an offer to purchase any securities in the United States or in any other jurisdiction in which such offer or solicitation is not authorized or to any person to whom it is unlawful to make such offer or solicitation. Users of this website are requested to inform themselves about and to observe any such restrictions. Except as otherwise explicitly stated herein as applicable to them, no information included on this website should be used by investors in forming their investment decision as to any securities. The information set forth on this website must not be distributed in the United States, to U.S. persons (as defined in Regulation S of the U.S. Securities Act of 1933, as amended), or to publications with a general circulation in the United States. Each violation of such limitations may constitute a violation of securities laws in the United States. Access to the information and documents contained on the following websites may be illegal in certain jurisdictions, and only certain categories of persons may be authorized to access such information and documents. All persons residing outside of the United States, Australia, Canada, the Hong Kong special administrative region of the People’s Republic of China, Japan, New Zealand or South Africa who wish to have access to the documents contained on this website should first ensure that they are not subject to local laws or regulations that restrict their right to access this website, or require registration or approval for any acquisition of securities by them. The Company assumes no responsibility if there is a violation of applicable law or regulations by any person. This information is only being distributed to and is only directed at (i) persons who are outside the United Kingdom or (ii) to investment professionals falling within Article 19(5) of the Financial Services and Markets Act 2000 (Financial Promotion) Order 2005 (the “Order”) or (iii) high net worth companies, and other persons to whom it may lawfully be communicated, falling within Article 49(2) of the Order (all such persons together being referred to as “relevant persons”). Any investment activity to which this document relates will be only available to, and will be engaged in only with, relevant persons. Any person who is not a relevant person should not act or rely on this announcement document or any of its contents. By clicking on the link below I confirm that I have read, understand and comply with all of the restrictions set forth above and that my country of residence and current location in not Australia, Canada, the Hong Kong special administrative region of the People’s Republic of China, Japan, New Zealand, South Africa or the United States or any other jurisdiction in which such a distribution or such access is unlawful. The application is now available in App Store and Google Play.